*. I’m always mildly suspicious of anything that promises to change my life, but I was interested in the Whole30 because of what some of my friends had to say about it. I balk at the word “paleo” – the term is so faddish, and so hyped, and so loaded. But what the Hartwigs have to say is so sensible, and not at all hyped. Their approach is just really sane. What’s more, they focus not just on food stuff, but several factors that contribute to a healthy life (check out the 9 factors they emphasize on their Whole 9 website). You can read about the Whole30 for free on their website, without having to buy the book, if you’d like. I wanted the book because it presents all the rationale behind their recommendations. It is an easy and compelling read. 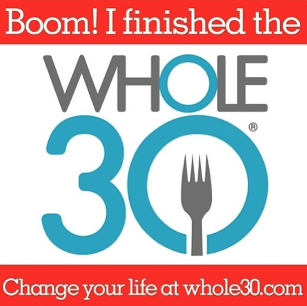 When I first read the book, though, I wasn’t in a position to try to give Whole30 a go. We had just moved out of our house due to flooding, and life was chaos. It stayed that way for the spring, the summer, and the early part of the fall – and then suddenly it was the holidays. In the meantime, I began to read some Paleo blogs and experiment with some recipes (in a future post, I will talk about some of my favorites). I found other voices of reason in the Paleo community there – people who are not so much looking back at how our mythical ancestors ate as they are looking at what seems most healthful now. 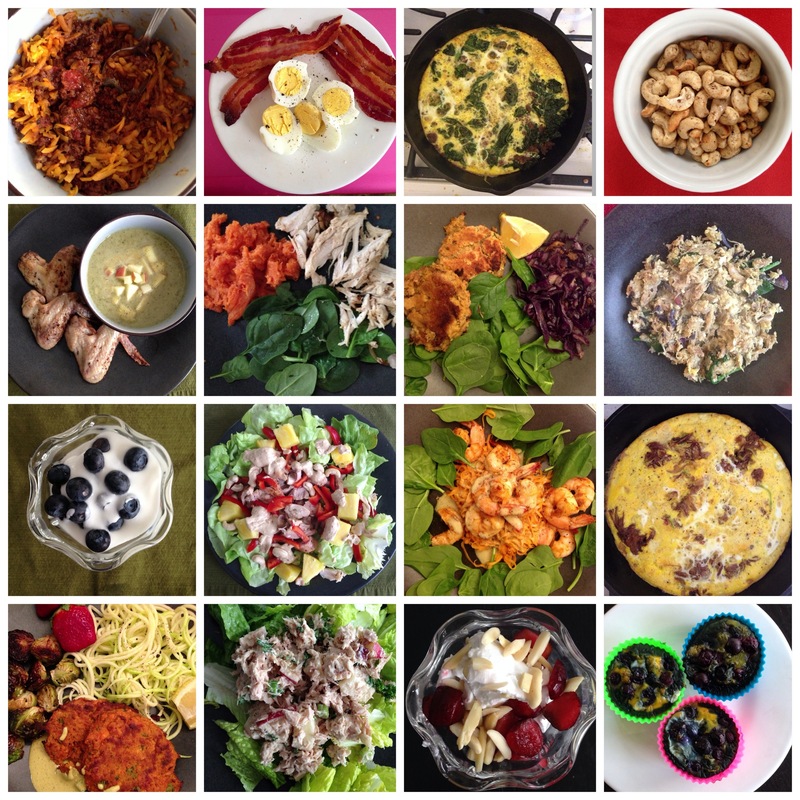 The Whole30 focuses on a diet based on real, whole (i.e., unprocessed) food: meats, eggs, vegetables, and fruit. There is: no sugar (including artificial) (the only sugar you eat is what occurs naturally in fruit); no grains; no legumes (including peanuts); no dairy; and no alcohol. Also, no paleo-fying of baked goods or junk food. I really, really thought this would be hard. And it really, really was not. I thought it would be hard because I love sugar. No, I’m serious. I LOVE sugar. I can’t count how many times over the last seven years I have given up sugar, or tried to. And in most cases, it has been a battle – I’ve never been able to do it without dealing with crankiness, cravings, and cavings. So I was entirely unprepared to find this so easy! In retrospect, I believe that in my previous efforts to eliminate sugar, I wasn’t getting enough protein and fat to feel satisfied. I was probably also eating too much fruit in proportion to the amount of veggies and protein I was taking in. With the Whole30, I am frankly stunned at how easy I found it to go without sugar and grains (the other stuff – dairy, legumes, alcohol – are not things I usually find particularly hard to give up, in comparison), and I think it has to do with feeling so completely satisfied with the food I’m eating. My meals leave me feeling full and sated, and I feel sustained from one meal to the next. Plus, they are super yummy. 1. Mood. In general, I’m usually a pretty happy person, but I also find that, typically, my mood fluctuates a lot in a day – I become impatient or irritable or anxious easily, and sometimes I react out of that. But during this Whole30, I noticed that my mood has become remarkably stable. I don’t have many peaks and valleys during the day – just a nice steady feeling of calm, happiness, and openness. I feel grounded, centered – and great! At first I thought maybe I was imagining all of this, but my husband confirms my sense of things – he has definitely noticed a positive difference on this count. I won’t attribute all of that to diet – I’d like to think my spiritual and relational practices also support a sense of calm and goodwill – but I do feel that what I’m eating has made a significant difference. I’m guessing it’s because I’ve gotten unhooked from the highs and lows that go along with eating sugar. 2. Energy. The same with my energy. A remarkable consistency. I’m not feeling any mid-afternoon drop in energy, the way I often do. In fact, I’ve completed quit having an afternoon cup of coffee – that was not a daily habit, but one that was frequent enough (maybe 3-4 times a week), that I noticed when I quit. And I didn’t set out to quit, I just realized I didn’t want it and I didn’t need it. My energy and mood are so even, I don’t want to mess that up with afternoon coffee. I feel as good and energetic at 2:00pm and 9:00pm as I do at 9:00am. 3. Organization. I have done a lot of cooking over the last thirty days – a lot more than I typically do – and it’s been easier than it ever has. Somehow this approach to food just makes sense to me in a way that is making all the planning, preparing, and cooking, just click. Ordinarily, my enthusiasm for time in the kitchen waxes and wanes. But with this approach to cooking and eating, I am finding just the right balance between structure and flexibility. I have found it really easy to have the building blocks for great meals in my fridge, and, while I do make a meal plan each week (and shop accordingly), I also improvise regularly, based on what I’m in the mood for and what I have in the fridge. I hope to write more about this soon. 4. Detachment. The best word I have for this is “unhooked.” As I’ve already noted, I feel unhooked from sugar and (equally surprisingly) grains. It’s not that I don’t find myself occasionally wanting something sweet, but when that happens, it happens without any serious emotional attachment. I can think, “Hmm, I would really enjoy a spoonful of Cookie Butter right now,” and that can be that. I can just acknowledge that without being hooked by it, and doing some sort of internal battle over whether to get into the jar of Cookie Butter. On this count, I should note that I did not do the recommended thing of getting rid of all temptation. I still have Christmas candy (my own, in addition to my kids) in my pantry. I still have jars of Cookie Butter my husband put in my Christmas stocking. I never felt tempted to get into any of it. I even baked things for church events – brownies, a trifle – and didn’t find myself mindlessly dipping into the raw batter. I think this is related both to the fact that I am just supremely satisfied (physically and emotionally) by the good, real food I am eating, and to the fact that my mood is calm enough to take an internal step back and be mindful about things. Pretty cool, huh? I should note that, while some people talk about experiencing the “Carb Flu” during the first days of starting Whole30, I actually never experienced that. And it wasn’t because I hadn’t been eating tons of carbs right before starting. I mean, it had been the holidays, and frankly, if a food had sugar or grain in it, it was in my mouth faster than you could say, “Merry Christmas.” I probably ate a little more fruit those first few days, which may have helped ease the transition for me, who knows. 5. Body. Yes, I also lost weight and fat. As of this morning, I have lost 8 pounds 4 ounces in the last 30 days. That’s how much I weighed when I was born, so I told my husband that I had lost a “baby me.” HAR. I’m hilarious, I know. I also lost one percentage point of fat, which is small potatoes, but I’ll take it (it might be hard to tell, because I carry a lot of my excess weight and fat around my midsection, which is fairly easy to camouflage, but I have plenty of fat to shed) (though perhaps I need it like a layer of protection during this arctic winter!). The Whole30 folks emphasize that weight is not the only (or even main) determiner of health, and I agree. But I’ll be honest that I would like to be a little closer to what I consider my ideal weight. Thanks to the Whole30, I’ve made a good start. So. For now, that’s my Whole30 report. I actually have a lot more to say (about resources I’ve found helpful, about some favorite meals, about what I did when I had to eat out), and I’ll be posting about this more soon, but I think this is quite sufficient for now. As I’m sure is clear, I am very, VERY happy with how these 30 days have gone. Which begs the question, now what? People have asked how I am going to eat now, will I keep going, etc. The Whole30 people walk you through a ten-day plan for trying some of the foods you’ve eliminated (not sugar, but legumes, gluten-free grains, grains with gluten), and I may give that a go. Long term, I’m thinking I want to eat Paleo-ish, with some exceptions for special meals or occasional treats. My wedding anniversary is next week, and I will definitely be having a nice meal out that will include some grains and sugar. We have extended family visiting later this month, and I’m already planning some of the goodies I will be baking. But I’m imagining that, long-term, I will be Paleo maybe 85% of the time? Maybe more? We’ll see. I just feel too good and am enjoying my food too much to get hooked back in to lots of sugar and grains. And after years of starting the day with a green smoothie (unsweetened almond milk, pomegranate juice, flaxseed, raw almonds, banana, raw baby spinach, frozen blueberries), I have to say that I am really loving eating a hot egg- or meat-based breakfast that holds me till lunch and doesn’t spike my blood sugar. This morning, I’ve started the day with turkey sausage, carrot soup, and a clementine. A couple of weeks ago, someone said something very condescending and dismissive about Paleo, concluding by telling me that she subscribed to Michael Pollan’s advice: “Eat food. Not too much. Mostly plants.” I can tell you unreservedly that this is exactly what the Whole30 has had me doing. Even with all the meat and eggs, more than half of my diet come from plants (I’d guess 8-9 servings a day of fruit+veggies, with – ideally but not always – twice as much veggies as fruit). I’m eating far more fruit and veggies than I ever did in my years as a vegetarian, and I’m eating at least as much as I did for the years I tried to follow ETL. I feel healthy, happy, and good. Here I am on Day Two of Whole 30, and *so* grateful for this report. Also, laughing delightedly at the pic of you eating the sugar from the bowl!!! My sistah. Thanks for your advice and example. Thanks, MaryBeth! I hope your Whole30 is going well! I’m so happy for you! Like you, I struggled with a lot of different fad diets and weight loss plans and “healthy eating” prescriptions. None of them felt right or worked for me. The Whole 30 clicked for me, though. I think a lot of why it worked for me in late August is I was just mentally in the right place. I also came to the realization late in the summer that eliminating foods from my diet IS NOT that hard – I’ve been gluten-free for 10 years or so (Celiac). Those two combined made it easier to accept the challenge. I wish you luck as you continue this journey, and look forward to reading more about your experience. Thanks so much for your nice words – and I’m always glad to hear from people for whom this style is working great. Very encouraging! Thanks for sharing your experiences! I think you’ve totally hit on the right attitude in saying that different eating approaches work well for some but not all. I’ve been vegetarian for 14 years, but I’m quick to recognize that it wouldn’t be ideal for everyone. I’d love to reduce my sugar and dairy intake, and I find your thoughts on feeling satisfied with other components very helpful. I’ll have to think about how to achieve that in a vegetarian diet. Thank you so much! I do think the key to reducing sugar intake is feeling satisfied without it – which can be so hard to do! I also like focusing on what I *can* eat rather than on what I’m eliminating. Thanks for your thoughtful comment. I so feel you on this. I go in phases of loving to cook and hating to be in the kitchen. And it’s true that doing the Whole30 requires lots of cooking. I’m trying to get in a rhythm of doing all my chopping just once or twice a week, because it’s the chopping prep that can really take the wind out of my sails. Thanks for the linkage, MaryBeth! Thanks for sharing. I think I’ll check it out. Without legumes and grains, it sounds like it might not be possible to do as a vegetarian. Any thoughts on that? Just thinking about whether George and I should give it a go. YES! I wrote you basically a book in the email I sent you directly, but I’m wanting other readers to see that *yes* it is possible to do this as a vegetarian, and there’s a section in the Whole30 info explaining how to make it work. Awesome post! Thank you so much for sharing! Thanks for this report. I can relate to the different food plans you’ve tried. I would love to hear more about resources and recipes. Good for you! Thanks, Jennifer! I just wrote a new post with my favorite resources – I hope it’s helpful! I gave up wheat in November. Actually I think I started on thanksgiving, although I didn’t go to a big meal for it so that didn’t end up being significant. But I also had a lot of changes, I also focused on lots of produce and protein and health fat (in my case, mostly cheese). I lost about ten pounds the first month. Maintenance has not been a s hard as it has been for other diets I’ve tried, and i don’t have to exercise constantly to feel like I won’t gain weight. It probably would have Beene aided to start in the spring or summer, but hey. I always like hearing and reading about others who have given up wheat with some success. Ten pounds in a month – wow! That’s awesome. I’m surprised at what a difference giving up grains has made for me. Thanks for the wonderful account! I’m surprised about how easy it was for you to give up grains. I rarely eat processed grains, but as a vegetarian there is no way I can give up grains entirely, but I like this approach to sugar. Cheers to finding something that not only works, but you like! I was surprised at how easy it was, too. Thanks for your nice comment! This series of posts has been SOOOO helpful! I’m excited about trying this myself. Thank you for the time and care you’ve put into sharing your experiences with Paleo and especially Whole30. Thanks so much, Janet. I’m glad my posts are helpful! Good luck with trying it out!